-We don't do news anymore as there is no point. This is what Twitter is for. -We no longer cover singles, videos, remixes (did we ever? ), track premieres or streams. This is not a question of quality but an editorial decision, so the answer will always be "no". We do include album streams in some articles, but there has to be some original content around it (a Track By Track maybe, or a Planet Gear piece). Stand alone album streams? Nope. -There are hundreds of albums released each week, and we cannot review them all. As a general rule, we rarely review EPs (unless by established artists) and tend to focus on releases by bona fide labels. That's not to say we won't cover independent albums, but it is impossible for us to listen to everything we are sent. Therefore, we have to pick and choose, so please be realistic. -The same goes for interviews and features. Given our meagre resources, we have to pick and choose who to interview, and what to write about. Look at the type (and stature) of the artists we have covered in the past and be realistic. -While we still commission live reviews, they tend to be of heritage and established acts, such as Nick Cave, Prince, and Suede. We're always keen to see tomorrow's superstars before they headline Wembley, but it's unlikely we'll agree to pen 1000 words about the experience (although like every rule, there are exceptions). -Sadly, we don't do photo galleries anymore. So, if you still think we'd like to hear from you, here is a list of who you should contact at DiS about what you might need. You're best off doing a bit of digging yourself to find the very best person for your question, but we'll try to make this page as useful as possible. Join our mailing list: MailChimp. If you'd like to send us your mass emails or have a general question, email press.releases@drownedinsound.com. We try to check this email once a week, but sometimes it's beyond us. Please note, you can contact most of our senior staff by emailing firstname@drownedinsound.com - however not all of our freelance contributors have DiS email accounts. If you'd like to send us things IN THE POST, we would like that very much. Please drop the relevant person an email for their address. Sean Adams was one of the co-founders of the site back in October 2000 and remains at the site's helm to this day. He's your first port of call for anything that isn't regarding features or album reviews (y'know, fun stuff like festival partnerships, free trips to Mexico...). Sean is also who you need to speak to about any technical issues, legal queries, or pretty much anything and everything that isn't covered below. Derek Robertson looks after all of our In-Depth editorial, which includes interviews, regular columns, artist-generated content, themed weeks, and site takeovers. A full list of columns and previous site takeovers can be found here. Our ad sales are conducted by w00tmedia. You can email them on DiSads@w00tmedia.net. Our community is quite good at self-moderatiring. However, we do have several volunteers who help moderate the boards, you can leave a comment on this board or post @moderators anywhere on the forums to get their attention. 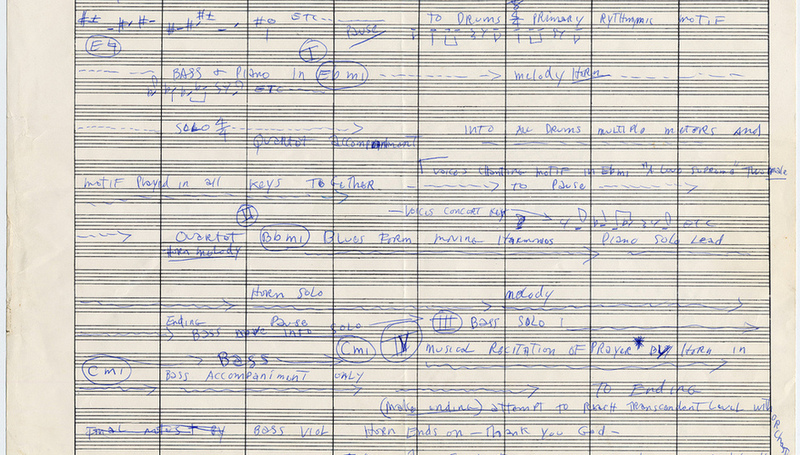 Image: John Coltrane’s Handwritten Outline for His Masterpiece A Love Supreme via Open Culture.